I’m Daniele from Italy and for every information you can find me in the Discord of LordSkunk under the nickname LELEZ. I’m here to talk about the new character that’s going to be released when the guilds will be a thing in this game: Jawa Engineer! 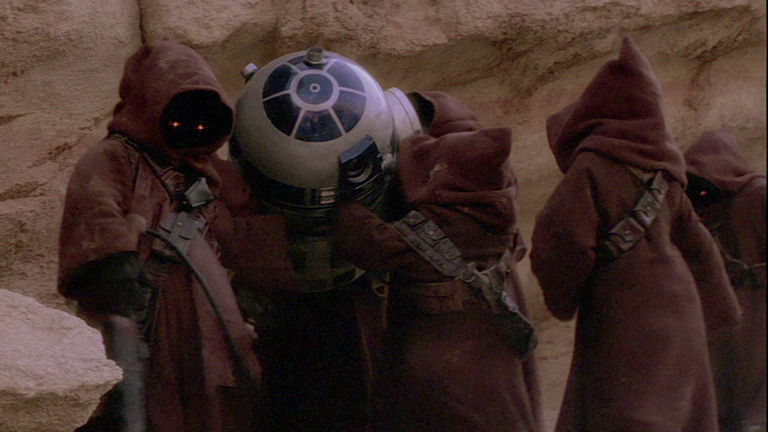 High-speed Jawa Healer with a Critical Chance buff and both Jawas and Droid synergy. Some info is telling us that this guy will probably be available in the new guild shipments and we got some preview of his abilities. Keep in mind that all of what I’m going to say could change, there is nothing official yet and this is only theory crafting with what we have at the moment. All around he looks an average guy with little over 24 thousands total life pool combining protection and health. He’s got good armor stat and a decent resistance, lacking a bit on the tenacity part. Good enough to not get one shotted by the glass cannons we all know about in this game (can they still one shot people after the protection patch?) and packing a very nice 153 speed stat, this means he’ll get to take at least one, but probably more turns during a fight. So now that we know he’s going to act, what are his abilities about? I want to start with his unique ability, it’s a passive bonus to his speed of +10 for each Jawa or droid ally. This is huge, considering his 153 base stat with 3 droids or Jawas in your lineup he’s going to be super-fast, if you want to push him to be the fastest character in the game playing only droids and Jawas i believe you could! We will talk about this later though, when I’ll be suggesting some team synergies. He also has a basic attack and two more special moves. The basic attack applies a detonator to target enemy that detonates one turn later dealing damage. For what the game offered so far I feel detonators are just a bad way to basic attack people out there. They don’t deal damage when you use them right away and they pack a lot of other problems with debuff situations and so on, pretty disappointing basic ability for him. The first special move has a 4 turns cooldown and qualifies him as a revive – healer, since JE revives a random droid ally at 1% health and then all allies recover 30% of their max health. This move is pretty good, the revive on droids we are certainly going to pair him with and the heal based on every character maximum health pool are both great. The second special has a 5 turns cooldown and makes him a star, let me tell you, since all allies gain critical chance up for 2 turns, and Jawa and Droid allies also gain 45% turn meter on top of that. Think about this for a second: he’s “the fastest” character in the game, giving out critical chance and 45% turn meter to his allies (as long as you pair him with droids or Jawas, which you will do). Basically all of your team will be going first in the first turn of the battle and they are going to hurt a lot. I’ll discuss here below about the different team compositions you could put him into, but for now I’d say he looks similar to Ewok Elder. He has a 100% revive, he can heal, he gives out turn meter to his synergy allies and he’s not super squishy. A good support character overall. I want to explain why I’m super exited (or scared maybe?) about JE, and I’m going to walk you through a couple of team comps to do so. To better use his abilities we want to pair him with a couple of droids for sure (we are going to skip Jawas for now since i don’t believe they can bring something super exceptional to the table, aside for a good anti-droid squad, which in fact could pop out being a prevalent strategy in the future because of the same JE! keep that in mind). The droids we want to pair him with are of course IG-86 and IG-88. This makes for the first 3 guys on our team and we still have 2 spots left, with a leader ability of choice. Do you want to pair them with the always good Poggle – Geonosian Soldier couple? go ahead they will shine! Do you prefer to protect them with a taunt? You have the space to do it! But what I’m going to put under the lights today, is the HK-47 leader spot that adds another droid to the team and builds up a huge synergy. What will happen is that your JE is the first to act in the battle, and he can give critical chance up for 2 turns and 45% turn meter to your 3 droids. Now they should be taking their turns since they “skipped” a half of the waiting time on them, and they will do that with critical chance up. I’m going to remember you that HK-47 leader ability says your droids get 30% critical chance and 50% turn meter whenever they score a critical hit. The three droids are going to score a critical hit almost for sure (If you use an area of effect move with IG-88 and HK-47 that’s even more probable) and they are going to deal a lot of damage and refill their turn meter bars super quickly, acting again and again while your opponents are waiting their turns (if they ever get one). The last spot in the team I’d suggest to fill it up with a taunter, to protect your guys (the JE can revive a droid also, so we aren’t looking too bad if someone dies) or even better with the recent changed Captain Phasma, granting 50% turn meter and a critical hit for sure (that will as well give you 50% turn meter for the droids thanks to the HK-47 leader spot). The lineup HK-47 (Leader), Phasma, Jawa Engineer, IG-88, IG-86 looks very good on paper, but of course stats and abilities could change, and the real fight tests are the only thing telling us if the synergy is good enough. I’m going to let you think about the other good options with this new character, suggesting you to look for droids, Jawas or critical hit interactions. Is the droid era coming back? Are you ready to unleash your 7 star General Grievous?